I also want to point out, an article or Facebook post criticizing Trump is vastly different from rioting. That's not true, but you need to pick your battles. The election is already lost (or won, depending on your position). It is waste of energy, and makes you look silly when you try to re-fight it. The upcoming battles will be against individual pieces of legislation and bringing scrutiny to questionable actions. The same way Obama was opposed during his presidency. The only ones who questioned the legitimacy of his presidency itself were the birthers, and even that was based on eligibility for the position and whether he met them, not a general distain for Obama himself. (Even if that was the motivation, it was not the technical reason). If you think there is a technicality that makes Trump ineligible for the presidency (not just you don't like him) by all means pursue it through the courts. By the way, if he actually does get oppressive legislation passed, then it will be time to protest, fight, and start a revolution. But overall, you don't just have to accept it. I am a huge fan of Donald Trump, and am thrilled he is our President-elect. He won the necessary electoral votes to win the election and it has now been determined that he also won the popular vote. It's time for anti-Trump, anti-Republican, anti- Conservative, and anti-Constitutionalist citizens to accept the results of the election and support the man who will become our new POTUS. We are all Americans. Dang, I'm sick of all the demonstrators, protesters, and rioters showing their blatant disrespect for our country and the office of the POTUS. And Obama was not opposed in the same was in 2008 or 2012. There were no riots. YOU'VE GOT TO ACCEPT IT. WE ALL DO, OR IT WON'T WORK. 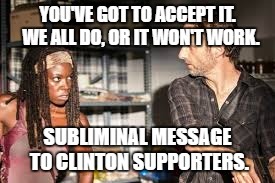 SUBLIMINAL MESSAGE TO CLINTON SUPPORTERS.